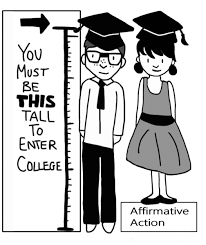 Affirmative action plays a role in college admissions. Beginning in the early 1960s, affirmative action was introduced by President John F. Kennedy to give minorities who would otherwise by looked over the equal chance to be accepted into jobs, colleges and other institutions. But the question remains: “Should affirmative action be abolished, or should it be perdured?”. Those who support it claim it gives people with no chance of entering college, due to their background, an opportunity to achieve their goals. The opposition claims it promotes modern-day discrimination and feels race shouldn’t be considered, given the fact everyone comes from different backgrounds regardless of race. A new Pew Research Center study found that 73 percent of Americans don’t support universities taking race into consideration, while 7 percent believe race should be a major factor in college admissions. The study also shows that white Americans believe on a higher average that race should not play a role in college admissions than the national average, while minorities had a lower percentage than the national average. Whatever the racial makeup, Americans have changed their views on the need to even out the employment gap between races. Affirmative Action has been a controversial policy that has had its meaning changed over the years due to different perspectives and laws, with many feeling it is outdated and should be abolished, while others feel the economic difference between minority groups and the majority hasn’t been filled, hence making it very much needed. This idea is common to many who support it. They claim it bridges inequalities in the employment of minorities, promotes diversities, and fixes past hindrances placed on minorities. For the most part, people with higher financial status have a larger chance of entering colleges than those from lower financial foundations. Supporters feel certain racial or ethnic groups that are of low-income families lack the same exposure and resources of those with high incomes. On the other hand, opposers of affirmative action claim that favoring a student because of their minority status is “reverse discrimination.” They believe it demeans accountability by lowering the standard, making minority students not work to achieve high standards of admission. They believe it projects an idea that minorities can’t succeed on their own, and need assistance like affirmative action to get admission, which cheapens their achievements, subsequently viewed as consequence of a policy rather than individual ability. The admission rate of minorities has been greatly affected by lawmakers who oppose affirmative action. Statistics show that after California abolished its affirmative action programs in 1998, the minority student admissions at UC Berkeley fell 61 percent, and minority admissions at UCLA fell 36 percent. After Texas abolished its affirmative action program in 1996, Rice University’s freshman class had 46 percent fewer African-Americans and 22 percent fewer Hispanic students. “If our society decimates affirmative action, people will not be treated fairly and ultimately create an environment of ignorance and hate,” said Ms. Robertson.